German corporation Bosch creates and manufactures consumer goods related to technology and security systems, in addition to high-quality household appliances. Bosch began manufacturing vacuum cleaners since 1900. Today they offer a large selection of cylinder vacuum cleaners, among them the Bosch Pro Energy vacuum, the Bosch Air Fresh vacuum and the Bosch Formula vacuum cleaner, as well as the Bosch Pet & Carpet vacuum, specially developed to gather up animal hair. With a Bosch vacuum in your home, you can achieve the level of cleanliness you insist upon. Fine dirt, stubborn house mites, pollen and bacteria have nowhere to hide from Bosch vacuum's maximum suction power. Motor power isn’t the only factor in achieving good suction from your vacuum: The vacuum bag also provides a critical element in maximizing your vacuum’s abilities. With Bosch vacuum bags, the motor and the bag work together to get your floor as clean as they can and keep your air even cleaner. After all that hard work, though, you don’t want those allergens you’ve just trapped to escape while changing an average everyday vacuum bag. The mechanics of dust bag replacement is yet another component in optimizing hygiene. That’s why Bosch developed a revolutionary one-step system that seals the Bosch vacuum bag as it’s lifted out of the vacuum, trapping the dirt within the bag so your hands never touch the dirt. The Bosch MEGAfilt SuperTEX type G bag contains three layers that trap 99% of all particles within the bag for maximum dust retention. Bag replacement is easy. Simply pull the tab to remove the bag and Bosch’s sealing system automatically closes the bag. For fine particles like drywall dust, plaster, cement, soot, use Bosch VAC013 Dust Bags (5 Pack) for an easier, cleaner disposal of vacuumed materials. 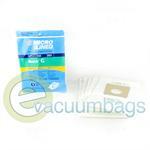 Generic EnviroCare Micro Filtration Paper Vacuum Bags for Bosch Compact Canister Vacuums Accepting Style G Bags. 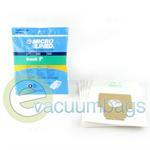 Generic EnviroCare Paper Vacuum Bags for Bosch Canister Vacuums. Accepting Style P Bags. 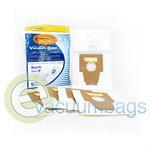 Generic Micro-Lined Paper Vacuum Bags for Bosch Model Vacuums using Type G Bags. 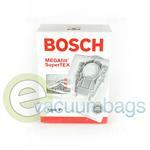 Genuine Bosch MEGAfilt / SuperTEX Filter Type P Paper Vacuum Bags for Bosch Premium and Ergomaxx Series Canister Vacuums. 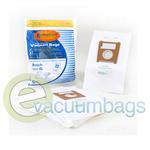 Generic DVC Micro-Lined Paper Vacuum Bags for Bosch Vacuum Cleaners using Type P Bags.